For me, it is a most-welcome stop on the road to the perfect floral chypre. Elegant, subtle and understated (compared, say, with the exuberance of Joy), it invites us into a bright, burnished environment of apricot-ey osmanthus, jasmine absolute de Grasse (as opulent here as in vintage No 5 extrait de parfum), rosa centifolia, rosa damascena, violet leaf absolute, patchouli, oak moss and sandalwood. On my skin, the heart notes seem to go on for decades. Certainly not a bargain to procure, be assured that the quality of the naturals here is unimpeachable. If you like Mitsouko, a bottle of this shouldn’t far off in your future. And it’s still available in the extrait de parfum. Who can guess for how long? For me, this is a golden standard; such followers, as Eau de Soir and Soir de Lune merely fall on the heels of this beauty. Well, if Britney Spears Curious and Angel are what it means to be Current, I'm relieved to know that at least the 3 of Us are proudly out-of-date. We are most definitely not out-of-date. Our shelf life is much, much longer. I agree with you, Chaya, that the Sisley scents will always be consigned to the shadow cast by "1000". There is a place for the "curent," but it doesn't necessarily have to be among the 5 or 6 scents that consistently renew my confidence in that parfumery's ART can do. Make that four out-of-date classic lovers - 1000 is a golden, beautiful scent indeed! Count me in as another 1000 lover. In fact, if the gentleman hadn't been so very Vieille France, I would've kissed Jean Kerléo on both cheeks for it when I met him. He told me lots of anecdotes on its composition, some of which I might use in a future post once I've cleared with him (it wasn't a formal interview). One thing though that's interesting, is that in his view, the eau de toilette is really quite good enough: he actually said I didn't need the parfum! Long Live the House of Patou, in all its glory! ps. I also got a chance to play with some vintage Carons - incredible! What a welcome and beautiful commentary on one of my top favorite perfumes ! I resent the "tired" reference of Mr. Luca Turin. 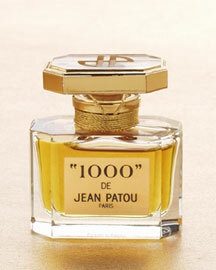 Patou 1000 is a chypre lover's dream of modern perfection. The osmanthus note is simply stunning and carries this multidimensional creation. I consider this scent to be utterly exquisite beyond description. I prefer it in the pure parfum or Eau de parfum. I first discovered this treasure while meandering the charming old town of Nice. A beautiful French womam from the Cote D'Ivoire introduced me to 1000. I feel instantly in love and bought 1/2 ounce of the parfum the next day. To this day nearly 23 years later I associate this scent with my honeymoon and the magnificent sensuality of the Cote D'azur !